TOP: Named after an early trader, Smith Lake is a ghost of its former self since the drought. However, it still provides a refreshing view of water in the desert of Eastern Agency. It's a natural lake perched in a depression atop the Continental Divide, and attracts ducks and amphibians. BOTTOM: Smith Lake Chapter members listen to Ryan Biehl of Souder, Miller and Associates explain why their drinking water tastes so bad and a possible solution at the regular chapter meeting last Friday. When you first pull into Smith Lake from New Mexico Route 371, your first thought is that this must be one of the luckiest chapters on the rez. 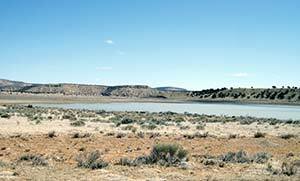 On the cool, broad spine of the Continental Divide sits a cluster of Navajo Housing Authority homes on the shore of what could either be described as a large pond or a small lake, complete with a bobbing pair of ducks. Good paved roads run perpendicular, one north to Farmington and south to Thoreau, the other west to Gallup. A well-stocked convenience store with gas pumps is just across the highway from the homes, and a big church (the former elementary school, closed when student enrollment started declining) is a short Sunday stroll away. Provided your needs are simple, everything you need is here, and if it isn't you can always speed toward the rest of the world on nearby I-40. It's not until you attend a chapter meeting that you begin to see below the shimmering surface of Smith Lake. Name : An early trader known as "Smith" or "Smitty" lent his name to the lake, which in turn lent its name to the chapter. The Navajo name for this area is Tinees Pasa'aa (Round Tree) for an unusual tree that grew on top of the mesa. 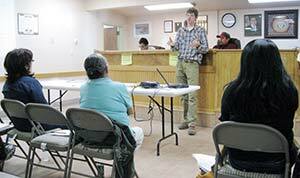 Issues: Foul-tasting, possibly carcinogenic water; unremediated uranium mines. Assets: Access to paved highways, the lake, a nice veterans' center and senior citizens' center. Upcoming events: An Easter potluck for seniors from Dalton Pass, Crownpoint, Standing Rock, Smith Lake, Mariano Lake, Casamero Lake and Becenti is planned for April 17.